Fighters from Carrier Air Wing 11 launched from the deck of USS Nimitz (CVN-68) on missions to strike ISIS positions on Monday, the Navy announced. Fighters from the “Argonauts” Strike Fighter Squadron (VFA) 147, “Black Knights” of VFA-154, the “Blue Diamonds” of VFA-146, the “Death Rattlers” of Marine Fighter Attack Squadron (VMFA) 323, and the “Bluetails” of Carrier Airborne Early Warning Squadron (VAW) 121 launched on Monday on missions over Iraq and Syria. “For the Nimitz Strike Group, today is game day,” said Rear Adm. Bill Byrne, commander of CSG-11 said in a statement. The Nimitz Carrier Strike Group arrived in U.S. 5th Fleet about a week and a half ago following the Exercise Malabar 2017 with the Indian military in the Indian Ocean. 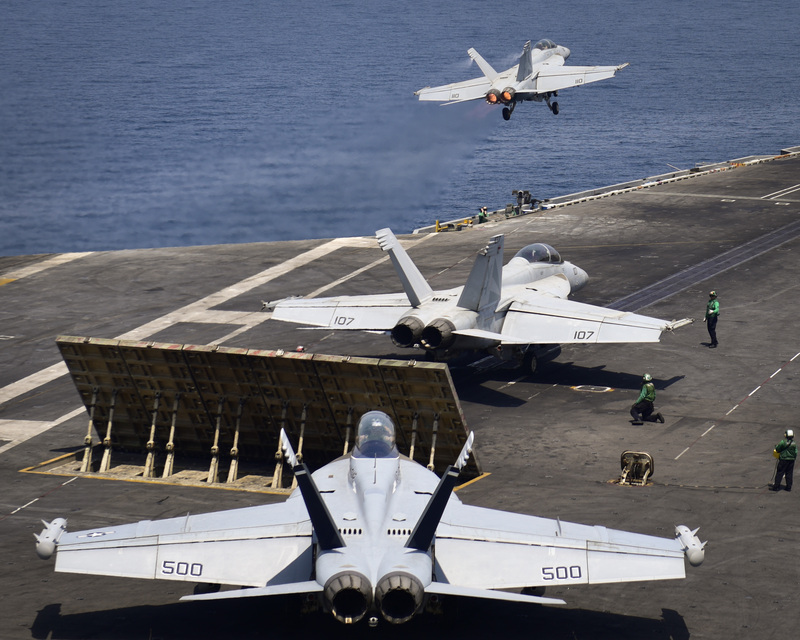 Nimitz operations in the Persian Gulf follow U.S. carrier strikes from the George H.W. Bush operating from the Eastern Mediterranean. Nimitz departed in early June from Naval Station Everett, Wash. The CSG is made up of Nimitz, guided-missile cruiser USS Princeton (CG-59), embarked Carrier Air Wing 11, guided-missile destroyers USS Howard (DDG-83), USS Shoup (DDG-86), USS Pinckney (DDG-91) and USS Kidd (DDG-100). The following is the complete statement from the U.S. Navy.